A rare find. 1997 NCAA Tournament leather basketball featuring Final Four logo and autographed by former Kentucky players Derek Anderson, Ron Mercer, Anthony Epps and Jared Prickett. Certificate of Authenticity included. Celebrate Malik Monk's award-winning year and Kentucky basketball's 'Elite' season in this exclusive, extremely limited, offer from The Cats' Pause. 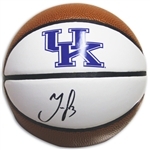 -- Full-size basketball personally autographed by Malik Monk and featuring UK logo. (Certificate of Authenticity included). -- One copy of “ELITE SEASON,” our new 136-page book celebrating the 2017 Elite Eight Kentucky basketball season. Includes profile on Monk and other players plus interviews with next year's incoming freshmen. Full-size basketball featuring autograph of Nerlens Noel. Includes Certificate of Authenticity. 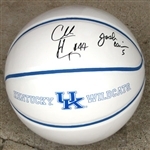 Full-size basketball autographed by 2005 Kentucky seniors Chuck Hayes and Josh Carrier. A centerpiece for any UK collection. Certificate of Authenticity included. Mini basketball featuring autograph of Nerlens Noel. Includes Certificate of Authenticity. Mini basketball autographed by Kentucky national champion point guard Marquis Teague. Includes Certificate of Authenticity. In stock and ready to ship. Terrence Jones autographed mini basketball. Includes Certificate of Authenticity. In stock and ready for immediate shipment. Mini basketball autographed by UK standout Darius Miller. Certificate of Authenticity included. Mini basketball autographed by former UK great and single-game scoring record holder Jodie Meeks. Certificate of Authenticity included. Antwain Barbour autographed mini basketball featuring UK logo. Comes in box perfect for showcasing. Certificate of Authenticity included. 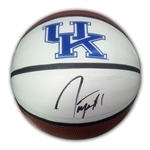 Josh Carrier autographed mini basketball featuring UK logo. Comes in box perfect for showcasing. Certificate of Authenticity included.